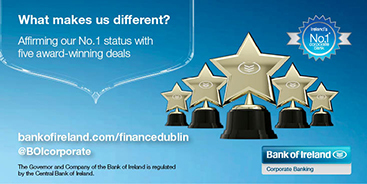 Bank of Ireland is honoured to have won five awards in Finance Dublin’s Deals of the Year 2017 including four transactions executed on behalf of our clients Greencore Group plc, Coillte, Dalata Hotel Group plc and daa plc as well as our award in respect of the Group’s credit risk transfer transaction executed through Grattan Securities. Greencore Group plc (‘Greencore’), a leading international producer of convenience foods and the world’s largest sandwich maker, has won the Mergers & Acquisitions Deal of the Year award for its acquisition of Peacock Foods and its associated financing. L-R = Gerard Britchfield, Finance Director, Coillte; Barry Dempsey, Head of Treasury, Coillte; Regina Walsh, Associate Director, Bank of Ireland; Sean Barrett, Senior Director, Bank of Ireland; Gerry Gillespie, Senior Manager, Bank of Ireland. [L-R] Ray O’Neill, Senior Treasury Manager, Bank of Ireland; Alan McNamara, Head of Capital Structuring, Bank of Ireland; Sinead Gormley, Senior Legal Advisor, Bank of Ireland; John Leahy, Treasury Manager, Bank of Ireland; Brian Kealy, Head of Capital Management, Bank of Ireland. “The success of the business to date is testament to Dalata’s highly experienced management team and Bank of Ireland, alongside our syndicate banking partners, is delighted to have played a key role in placing Dalata in a strong position to deliver future growth.” Rob Quinn, Head of Hotels Portfolio, Bank of Ireland. L-R = Rob Quinn, Head of Hotels Portfolio, Bank of Ireland; Carol Phelan, Group Finance Manager, Dalata Hotel Group plc; Maurice Healy, Director, Bank of Ireland. The Finance Dublin Debt Capital Markets Refinancing Deal of the Year went to daa plc’s €400 million tender offer and new note issuance, undertaken through its wholly-owned financing vehicle daa finance plc. [L-R] Regina Walsh, Associate Director, Bank of Ireland and Maurice Healy, Director, Bank of Ireland.